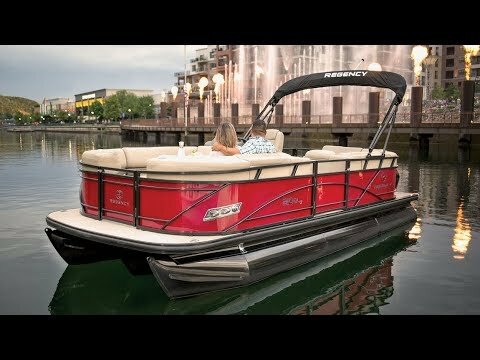 The REGENCY® 210 DL3 is a nimble 23’ 4” long, but still offers you and your guests a full complement of comfort and convenience features. So, come onboard and lounge away the afternoon in the comfort of the fore and aft seats. All three feature our exclusive Stow More™ seat storage system, which adds an easily accessible backrest compartment for added functionality and convenience. The bow couches also have below-seat lockers for securing valuables while you venture ashore. A Bluetooth® stereo, movable table and in-floor storage add to the options. All wrapped in a stylish exterior that includes Diamond Coat™ powder-coated logs and railings. Pontoon log length: 21' 1"
Max. person weight: 1375 lbs. Average dry weight: 3148 lbs. Average package weight: 5448 lbs.